Pain is subjective, as what one person finds painful another may not. During tattoo removal a client can expect to feel a level of discomfort however pain is an individual experience. Most may compare the pain to a flick from an elastic band. At Think Again Laser Clinic we use a dedicated pain reducing system; the Zimmer. This is an optimal cooling system used on the area before, during and after treatment which produces a stream of chilled air at -40 degrees Celsius. The stream of air minimises pain and thermal injury to the patient and unlike other cooling methods such as ice packs or other contact cooling; our machine can be applied during the treatment process without interrupting the laser. There is no need for the patient to experience unnecessary discomfort during treatment and this is why we use the leading cooling system. We offer optional anaesthetic creams in the clinic (they can also be purchased at a chemist), which can be used in conjunction with the Zimmer to further reduce the level of discomfort experienced. These must however be applied at least 1.5 – 2 hours prior to your scheduled treatment. We offer each client one free application of topical numbing cream so you can experience the difference prior to purchasing a tube. If you are interested in taking advantage of our offer, please let our specialist know when booking your appointment so we can book you in for application a minimum of 1hr prior to your appointment. We are located in Rozelle, a fantastic area for beautiful cafes you can enjoy a coffee or a meal while you wait for your numbing cream to take full effect. Can I only have part of my tattoo removed? Yes! With precision our award winning laser and experienced specialist can target as much or as little of your tattoo as you would like. Our smallest hand piece can target 2mm, so you have the option of removing the most intricate details surrounding or within your current tattoo. Our Quanta Discovery Pico Plus uses a square laser beam which allows for even laser distribution minimising any overlap on the tattoo. At Think Again Laser Clinic we believe a high level service should be accessible to everyone, so we are constantly creating new ways for you to save on treatments. Make sure to visit our website and follow our social media pages to keep up to date with our latest promotions and competitions. We offer our clients a customised discount for the treatment of multiple tattoos and can guarantee competitive pricing for our level of technology and a high quality service. We also offer our clients discounts if they choose to pre-purchase their treatments. Pre purchase 4 to save 15% or pre purchase 6 to save 20%. For our current clients, we remind you that you are also entitled to our referral program. Refer a friend, when they are treated your friend receives 25% off their first treatment and you will also receive 25% off your next treatment! How long does a typical treatment go for? It is important during your first visit to the clinic during your free consultation that our laser specialists assess your tattoo and provide you with the most transparent outcome. 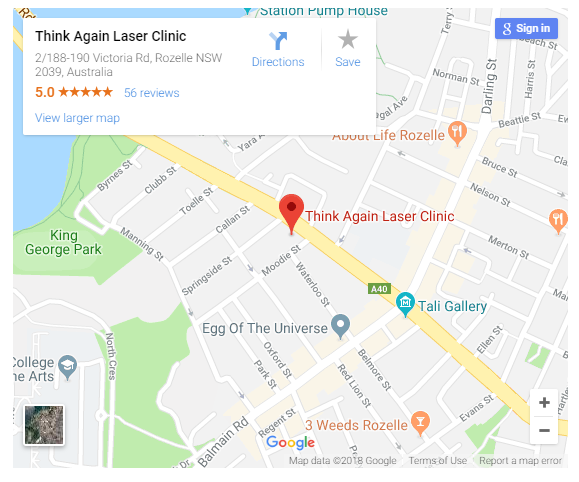 They will spend around 20 – 30 minutes with you as they explain how tattoo removal works, our process and how we differ from every other clinic, diagnose your skin and answer any questions you have. Should you wish to be treated on the same day we always allow enough time. The actual treatment time is dependant on the size of the tattoo and can be complete in just a few minutes. Very small tattoos can be complete in 30 seconds to a couple of minutes, where as larger areas can expect 10-15 minutes of laser time. We spend time preparing your skin with the cooling machine and bandaging you post treatment so for consecutive treatments, you can expect to spend 15-20 minutes in the clinic. Why is our machine more effective? The majority of Q-switch laser machines available in the market consist of only one laser i.e. Nd:Yag which can deliver two wavelengths 1064 nm (targeting black) and 532 nm (for targeting red), but to remove green colours it is impossible. There is often quite a lot of hype regarding the PicoSure which is largely due to it’s ‘world first’ media presence and “it style” impression. It is important to know the effectiveness of the machine is determined by physics, nothing else. Taking into account the different depths within the skin where coloured ink resides, research has proven multiple wavelengths are required for effective tattoo removal. Black settles the deepest which will require a ND:YAG 1064 wavelength; red, yellow, pink and orange settles the highest in the skin requiring a 532 wavelength and blues and greens will settle somewhere in the middle needing a 694 wavelength. The PicoSure laser only offers one wavelength (755). If you imagine the depth of your skin being in numerical order and taking into account the depths each colour will sit, the PicoSure 755 wavelength will pass straight through any red, yellow, pink or orange along with any blues or green and also fall short of reaching black or darker colours. A wavelength will determine how deep the laser light will penetrate the skin. However not all lasers are capable of producing each necessary wavelength needed to remove certain colours of ink. Since coloured ink will naturally settle in different depths of the skin, the capability of these settings are essential. Black settles the deepest which will require a 1064 wavelength; red, yellow, pink and orange settles the highest in the skin requiring a 532 wavelength and blues and greens will settle somewhere in the middle needing a 694 wavelength. Each wavelength penetrates different depths of the skin, ultimately targeting different colours. However, if the laser system does not have the available energy or sufficient power the desired result will not be achieved. Do you treat cosmetic tattoos? Yes we certainly do. Cosmetic tattoo removal is a much more complex process. Our price starts at $150. Generally our clients can expect results in 2 – 6 treatments. However, it is important you visit the clinic for a free cosmetic consultation to discuss your expected outcome and what you can expect post treatment. How should I care for my tattoo post treatment? Proper post treatment care is your best chance at ensuring your skin recovers as quickly as possible. The better condition your skin is in prior to treatment, the better your results will be. We have invested in the highest quality Post Laser Cream, Acacia Organics Post Laser which is 100% natural and organic. Our advice during the post treatment phase does not end after each session. Our specialists are also available to provide support using our after hours number available to each and every client. • Avoid direct sun exposure for the first two weeks and ensure spf 50+ sun cream is applied thereafter during the entire tattoo removal process. • Showering is acceptable after 24 hours, however it is advised that you avoid prolonged exposure to water and avoid excessive heat in the skin for 48 – 72hours post treatment. This includes direct water pressure from a shower, exercise, swimming pools, using a bath etc. Excess moisture will hinder the wound/scab from healing. • Avoid scratching, picking or touching the direct or surrounding area. 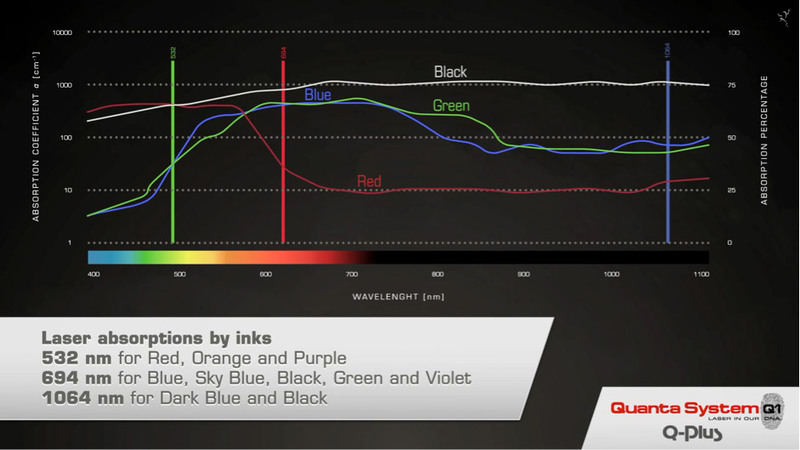 The colours involved in the ink – different colours require a different setting on the laser to effectively control the power of the laser energy and remove the ink. Complex multicolour designs will take more time than a simple one colour design. Come into our clinic today for an obligation, FREE consultation and trial test patch. In person we can provide a more specific and expert assessment of your individual tattoo. Can my tattoo be completely removed? In almost ALL cases YES. 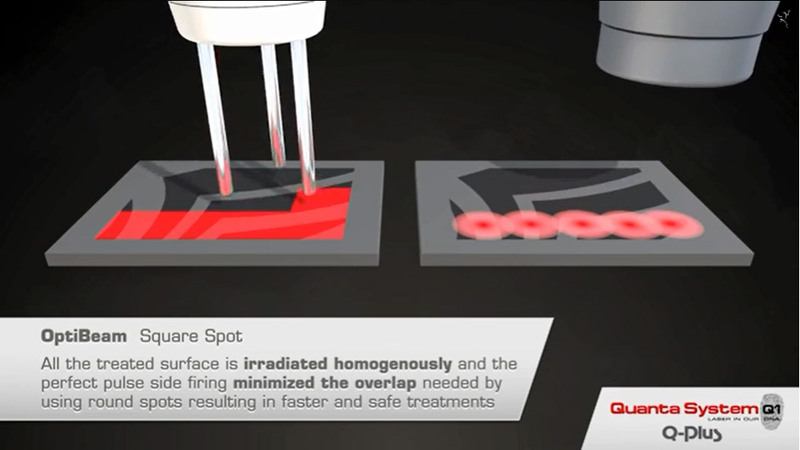 Using the Quanta Q Plus C system you will be treated by the only machine in the world which truly uses the required 3 dedicated wavelengths to affectively treat ALL colours of tattoos (except white). Your laser clinician will be able to provide a clear expectation at consultation. All tattoos can be treated using the Quanta Q-Plus C. There are other systems used to treat the whole range of colours of tattoos which claim to be effective, but in reality cannot affectively treat hard to remove colours due to there not being a dedicated RUBY laser at 694 nm. If your technician is changing handpieces during the treatment process, the reality is that they do not have the required Ruby 694nm laser and lightening at best can only be expected. Ask your current technician if they have the dedicated 694nm wavelength, if their answer is no, they cannot achieve the desired results for all tattoos. Results may vary if the tattoo has already been treated for laser tattoo removal or any other removal procedure. Will my skin return to normal ? In almost all cases YES, however if the original tattoo has been covered multiple times this process may be more difficult. Some pigment lightening may result which will return to normal during the skins normal tanning process. Tattoos which have already been treated with incapable machines may also provide a more difficult and longer process to achieve complete removal. This is because the energy of their laser could have caused a reaction to the tattoo pigment creating a ‘glue’ type effect in the deep layers of the skin. White tattoos reflect the laser light and do not respond to laser treatment, preventing the skin to return to its original state. It is important to advise your laser specialist if your tattoo contains any layers of white ink as the removal process must be handled in a different way. How will my skin react to the treatment? Immediately after treatment the surrounding skin is likely to show a red discoloration and a small amount of pinpoint bleeding may occur. The feeling can be compared to a mild sunburn where swelling and redness may last for one week. Over the next few days a small amount of blistering may occur followed by a scab or thin crust, which should be left untouched to eventually fall off. Hindering a scab from dislodging naturally and removing it early may result in the development of a scar. The skin will remain red for a few days to a week or two and begin to heal on its own. All of these reactions are a normal response to the removal process and the way in which the body begins to heal. Who will conduct my treatment, and how are they qualified? All our technicians at Think Again Laser Clinic are highly qualified in tattoo removal, laser equipment and safety. They are all government accredited Laser professionals, and have undertaken an additional ‘Skin Science for Laser Tattoo Removal’ course. We pride ourselves on our optimum levels of safety to ensure affective results are delivered to our clients. Since tattoo removal is all we do you can be assured we will provide the experience and expertise necessary to gain the very best results. Can I begin my next treatment earlier than 6 weeks? Unfortunately not. Without waiting a minimum of 6 weeks you will not be allowing the body to naturally filter out the old shattered particles of ink. The tattoo will not be removed any faster and may cause damage or scarring to the tissue especially if it has not been given enough time to properly heal. We recommend a minimum of 6 weeks with up to 8 weeks being desirable for colour tattoos. Tattoos are balls of ink that are injected into the superficial layer of the skin. These balls of ink are then stored amongst immune cells where they get stuck and are too large to be carried away. Extremely short nanosecond bursts of light energy penetrate the skin through the tattoo ink pigment leaving surrounding skin untouched. The laser passes beneath the first layer of the skin into the dermis (the second layer) where the ink molecules absorb the laser energy and are shattered into smaller pieces that are then absorbed into the blood stream. The body will then begin the process of harmlessly removing the ink through the lymphatic system which will take at least 6 weeks for the process to be successful. For this reason, treatments will be scheduled 6 weeks apart so we can allow for the body to naturally filter the ink. Get in touch with us today for an obligation free tattoo assessment, or get in touch on Facebook, Instagram or Google Plus!